It all starts from the time when every bride-to-be was once a little girl. And the little girl grew up watching Disney princesses and dreaming of their gorgeous gowns. But one day when those girls grow up and it’s about time to choose their own wedding gown, they realise that may be Cinderella’s ball gown isn’t really their thing. After all, just like everyone else, brides belong to the real world, and not all of them might ever have worn a gown, and a grand silhouette might deter them! But, modern brides are blessed with innumerable silhouettes of wedding gowns and all it takes to start on this front is your very first appointment. ‘Brides-to-be will be surprised when they come to realise that their bridal gown style is dependent on so many factors,’ says Mye Gomez, senior staffer at The Wedding Shop, Jumeirah Centre - Beach Road. A leading bridal boutique in Dubai, The Wedding Shop houses ready-to-wear bridal gowns from Spain, Canada, USA and the UK. So, what do you need to keep in mind when choosing your wedding gown? Timeline: It is important that the bride-to-be keeps enough time for her wedding gown shopping. Dream gowns take time. ‘A foolproof way to ensure brides don’t feel stressed about their dream gown is to start wedding gown shopping at least 7-8 months before the wedding,’ suggests Mye. Location: ‘Location is the biggest factor to consider when deciding the gown silhouette or the train,’ says Mye. ‘If you’re planning a beach wedding, the brides like to pick a minimalist gown with an unfussy silhouette that allows her to move and mingle,’ she explains. ‘But we find when it’s an Arabic wedding, a grand ball gown won’t be a problem, because the bride will not be moving around much.’ Also, if it’s a church wedding, then one has to think about appropriate sleeves and necklines. ‘Some churches might not allow brides to wear off-shoulder or strapless wedding attire or deep necklines,’ explains Mye. ‘If you are having a destination wedding like a beach ceremony, you have the freedom to experiment and your bridal dress can have a long slit as well,’ says Anna Khamsi, owner of Perfection Bridal Wedding Gowns, a Dubai-based Online Boutique with a trial location in JBR. ‘For such a wedding, either the silhouette has to be simpler or the dress could have a detachable train so the bride can move around easily,’ she says. Body type: ‘The other equally-important factor your gown style depends on is your body type. 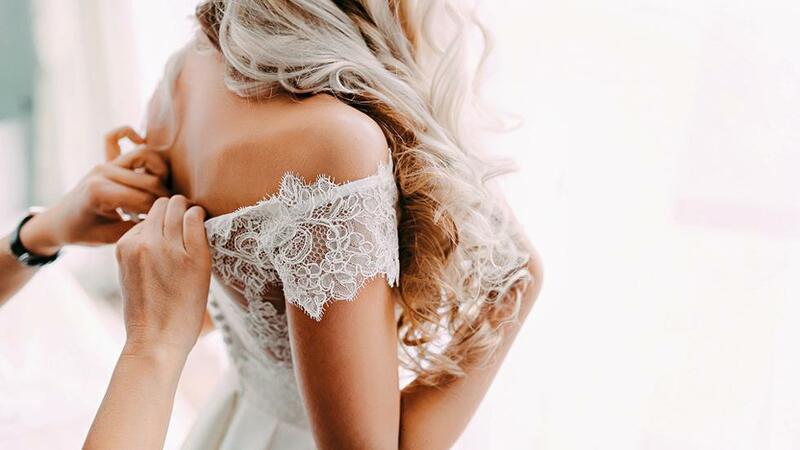 Just by choosing the right gown shape, every bride can look her most beautiful self,’ says Jessy Rebekah Pereira, founder and managing director of Rebekah’s Bespoke Tailoring, Jumeirah Village Circle, which caters to custom orders for bridal as well as evening gowns. ‘When a bride comes to us, the first thing we do is a body shape analysis consultation,’ adds Jessy. ‘This involves taking the bride’s measurements to analyse her body type and then suggesting to her the most flattering silhouettes for her specific body type,’ she explains. Personal style: If you have never worn an evening gown, familiarise yourself with long silhouettes by browsing and trying on evening gowns. ‘Don’t hesitate about trying on your dream silhouette as well as some other new silhouettes your first time out wedding gown shopping,’ says Anna. Remember, boutiques are only too happy to oblige your request for trying out many gowns as they want you to first see for yourself how these gowns look. This exercise helps you familiarise yourself with the idea of a gown and also how various gowns feel on the inside. ‘If you have known and are comfortable with a certain kind of neckline in your real life, and if there’s a certain kind of dress shape or silhouette you have worn and felt comfortable in, like an A-Line long dress, for instance, go for it,’ says Anna. ‘White and all its shades are always popular, but one more style that’s very popular nowadays, is skin tone colour wedding gown,’ says Anna. These have a lot of white lace and applique to add to their romantic, soft appeal and are a current favourite with European weddings. » Ideally, for a month, try to be at your fittest, most toned version before you approach bridal gown shopping. » Do your homework and carry ample pictures of wedding gowns you like. Scout Pinterest and Instagram for creative inspirations to show to boutiques. » Make an appointment as it is a once-in-a-lifetime experience. » Take a trusted friend or family member for honest advice. 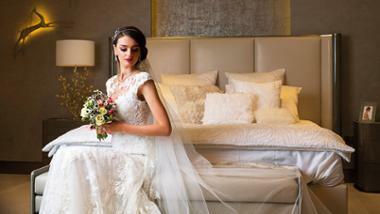 » Prepare to be quizzed on many aspects related to your wedding when you approach a bridal gown boutique. Discuss the location options with your family and fiancé before going wedding gown shopping. » Try on your dream silhouette as well as some other silhouettes to find your perfect one. » Pay attention when bridal wear consultants and dressmakers talk to you regarding what might not work for you.